I had just come of my first Smith River trip in a few years, a multi-family affair to Montana's Disney Land that brought us four days of perfect weather and overnight float fun. I was re-finding my Mo' River groove on the fly. The flows were up a bit, still great dryfly fishing levels, but the next hatch was at least a week away. And then it arrived early. Pale Morning Dun mayflies. The big ones. Not everywhere, but in enough of the usual haunts to go hunting for the fish that were hunting the bugs. Being on the front end of a hatch cycle is the best place to be if you want to find mature and reckless fish. They are as excited as we are to see fresh insects, and they want to gobble up as many as they can as fast as they can. What was interesting about this scenario was that as the hatch intensified over the course of the next couple weeks the river flows varied substantially. It went up a thousand cfs, and the trout didn't mind. It went up another thousand, and the trout didn't mind. It went up another two thousand, and the fish seemed to get happier. Finally the river peaked at about what I would consider double the optimal dryfly fishing flows, and the trout were still rising. More than that, instead of moving to soft inside corners for protection, they were holding tight on the fast rip-rap banks and points, making themselves incredibly visible as they hung high in the water column. "ON the bank, looks like a crocodile." "Yes! Cast at it, quick!" 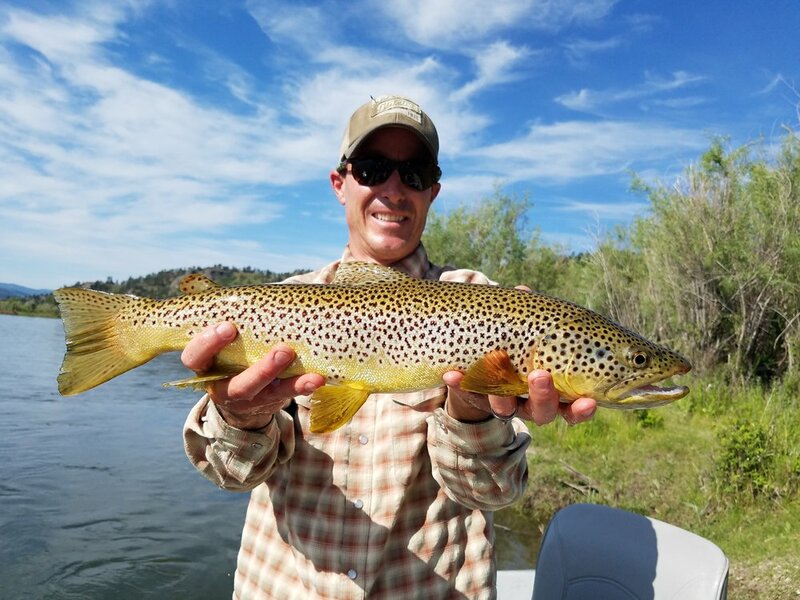 It was a roller coaster ride of trout opportunities, trying to hold the boat with quick dip oar strokes long enough for my anglers to find the fish and feed them. For a few days we were exclusively targeting brown in the 18-24 inch range. We landed some truly memorable trout and shared countless 'did you see that?!?' moments. It was beyond awesome. And then it was over. The river dropped, the hatch continued, and we returned to normal mid-June programming; still stellar, just not other-worldly. It was a one every five year occurrence, and we made the most of it. I can't wait to see what this June brings.